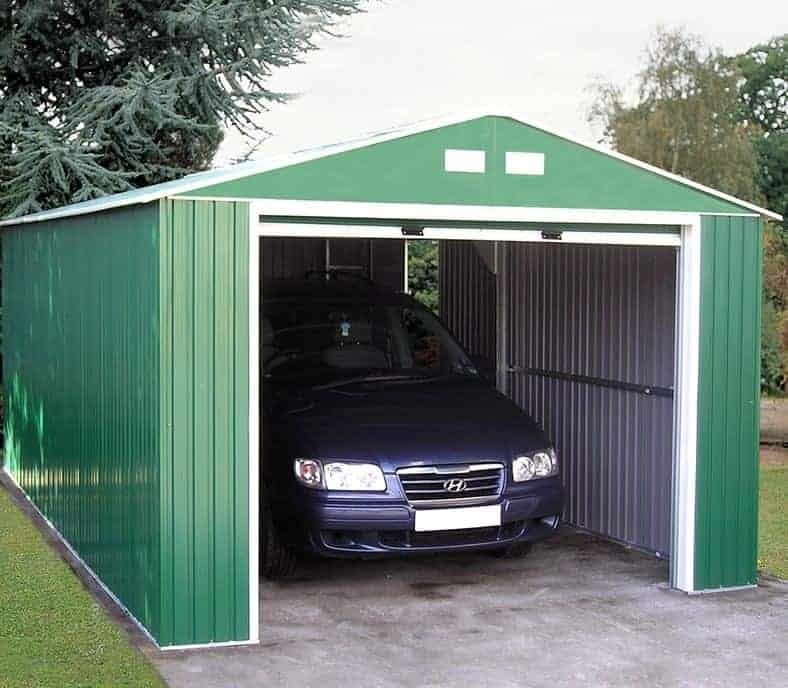 If you’re looking for a large garage that’s very tough and yet has an attractive colour scheme then this Olympian metal garage from Store More is a great place to start. It’s very tall and yet also wide and deep, so you can easily fit in a standard family car or even a 4 X 4. 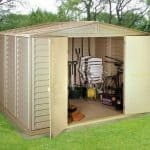 With self assembly possible thanks to the straightforward instructions, you can save a lot of time and company compared to having a brick built garage constructed. 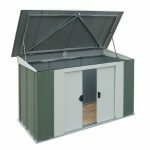 Thanks to its generous dimensions we can also imagine this building being used as a workshop for a hobby or a business, and the ventilated gables ensure that a constant supply of fresh air gets in, creating a pleasant interior to spend time in. This interior is accessed either through the main roll up and over garage door, or via a side personnel door. The metal cladding isn’t as thick as some we’ve seen, and yet the structure as a whole is both strong and stable when it has been screwed down to a level area of concrete. 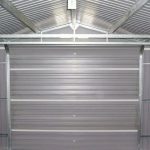 We were pleased to see that hot dipped galvanised steel had been used, giving extra durability and allowing a long 10 year warranty period. 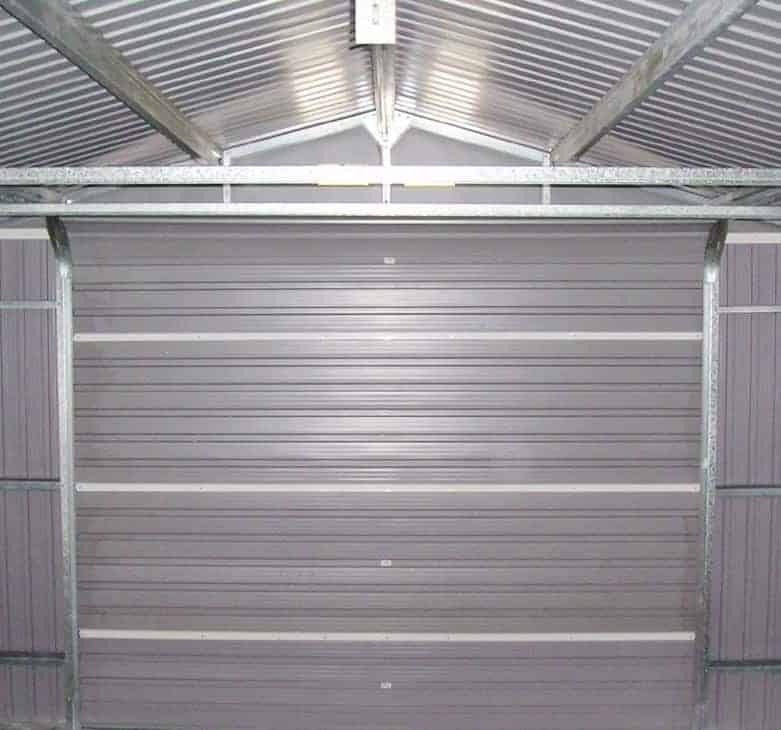 This large metal building makes a great value garage for a single car, but it could easily be used as a workshop as well with the addition of a light source. The first thing we noticed about it, aside from its generous height, is how attractive it looks. The ivy green colour scheme, with contrasting white highlights, mean that it will fit in perfectly with a garden environment. At the summit of the garage is an apex roof, and this performs the vital function of channeling water away so that it can’t sit on the surface and potentially cause rust. It also adds a lot of height, as shown by the ridge height of 2.59m, or eight and a half feet, and an eaves height of 2.10m. 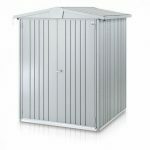 When deciding where to position the building, keep in mind its overall width of 3.72m and its overall depth of 6.04m as your base will need to be at least this size. Cladding becomes even more important in large structures such as this, so we were pleased to see that hot dipped galvanised steel had been used for the walls and the roof. This means that zinc has been bonded with the steel to create a metal that’s very tough and water resistant. The layer of paint on top then gives more protection. 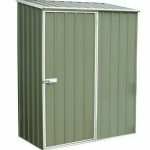 Whilst we have reviewed metal sheds and garages that have slightly thicker cladding, this still creates a strong and stable building when allied to its tough frame. There is no floor included, as the garage is designed to be affixed to a pre-existing flat area of concrete. This is as we’d expect, but we would also expect to see a fixing kit for this purpose included as standard. At this price, we were disappointed to see that the customer has to be screws or an anchor kit separately. Large metal structures can be prone to rot, although the apex roof that carries water away and the galvanised nature of the cladding both help to combat this potential problem. That’s why the manufacturer has been able to give a 10 year warranty against the appearance of perforations caused by rust. This is as long as most warranties we see on metal buildings, so we welcome the added peace of mind that it gives the customer. 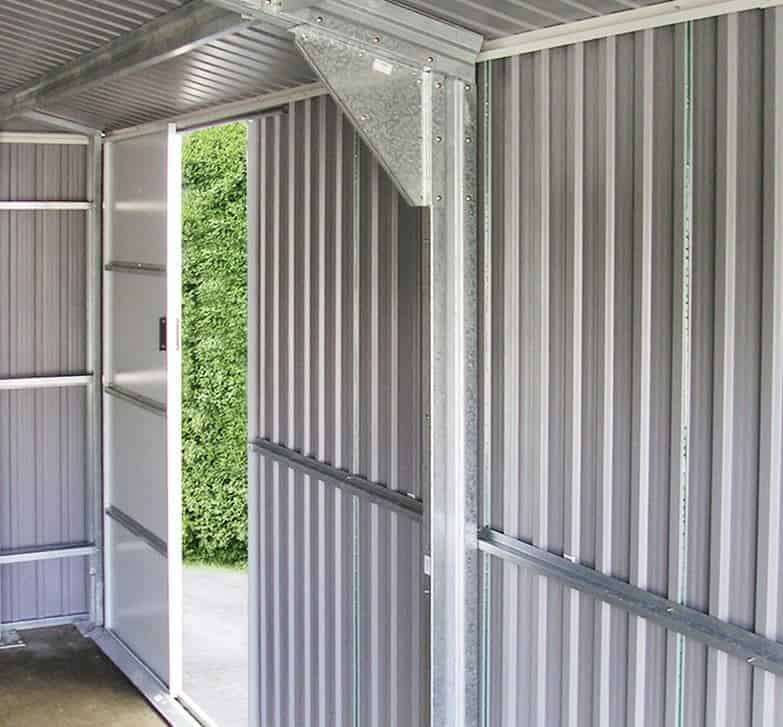 As always with metal garages there are no treatment requirements to worry about, saving time and money. There are two very different doors included with this garage, and we found both of them impressive in their own way. Firstly there’s the large door at the front of the garage that rolls up and over in typical garage roller door style. It’s tall, at 2.05m, and very wide at 2.52m, so there’ll be no concerns about catching the sides with a car. Towards the rear there’s also a metal personnel door, measuring 0.69m wide and 2.01m tall, making access easy even when a car is parked inside the garage. This will come in particularly useful if the building is used as a workshop. There are no windows to this garage, which is good for security but we would have liked to see a translucent panel or two used on the roof to allow light in. One feature we were glad to see, however, was the large vents on the gable ends that create a constant supply of fresh air inside the garage. The lack of windows itself acts as a security feature, as it means that those with less than honest intentions will have no way of knowing what’s stored inside. The best security feature of all, however, would have been a secure locking and alarm system and unfortunately these are not included. The doors are padlockable, however, so it will be easy to attach one once purchased. The first extra we would recommend, as mentioned above, is a padlock and ideally an alarm system. These will have to be sourced elsewhere, but they don’t have to be an expensive purchase. The optional extra that can be purchased along with the garage is a set of Hilti screws. These can be used to anchor the garage to a level concrete floor, but as this is an essential function we do feel that they should have been included with the standard package. We were impressed by how well fabricated all the components were, but we would have liked to see slightly thicker cladding used. The hot dipped galvanised cladding has excellent durability, and is maintenance free without the threat of cracks or warping. Whilst we review metal garages that are even larger than this, this is still very generously proportioned and has lots of headroom. Whilst the instructions are both comprehensive and clear, the size and scale of this building means that it can take some time to install. With a friend’s help be prepared to take a full day or even two. 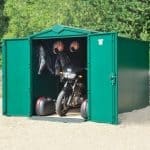 For such a large garage, with a 10 year warranty included, we feel this provides good value for money even at this price. Final Thoughts: If you’re parking your car on the drive, or even the street, every night then it’s time to think of buying a garage and this can be a perfect choice. It’s relatively inexpensive considering its size and durability, and it can be fully installed and ready to use within a day. Yes, an anchor kit has to be bought, such as the set of Hilti screws available as an optional item, and a strong lock and good quality alarm is a must to create a secure parking space, but these needn’t add significantly to the price you pay. 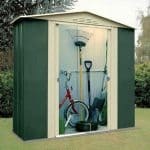 It’s a garage you’ll be proud to have on your property, and we found the colour scheme to be eye catching and pleasing.